The following interview was conducted via e-mail with Ian Post, one of the student organizers involved in an effort to prevent Michigan Governor Rick Snyder from being a Commencement Speaker this April at GVSU. For updates on this campaign go to their Facebook page. 1) How did this effort to prevent Gov. Snyder from being a commencement speaker come about? 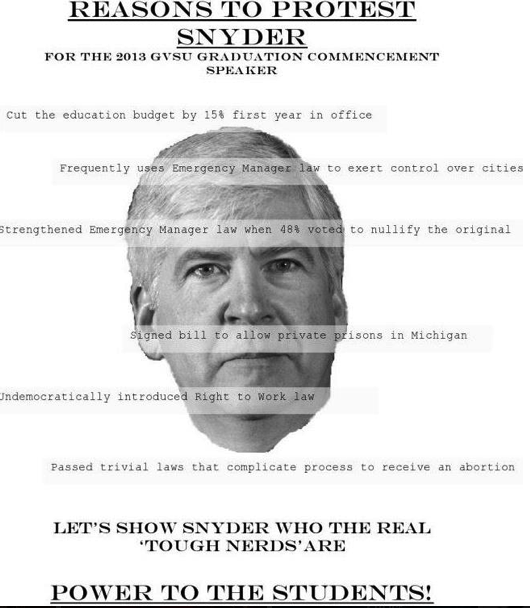 The effort to prevent Governor Snyder from being the Commencement speaker began when a few seniors became aware that he was chosen at the Board of Trustees meeting and voiced their concern at our place of work. As a junior, I saw this as a much larger problem that affected more people than the graduates. This led a couple of concerned students to take action against the administration’s decision. 2) What actions have you taken so far in this campaign? So far the effort includes a physical petition, an online petition, social networking tools, and one small protest on campus that gathered petition signatures. There will be more protests in the following weeks. We have also been forming a coalition with other campus activist groups that will strengthen the voice of the students. 3) What has been the reaction from students, faculty and staff? The reaction from students, staff, and faculty has been surprisingly welcoming. Students who see the title of the petition voluntarily approach us and ask if they can sign. When I printed the first petition in the library, a senior approached and asked if it was legitimate and whether or not he could sign. The GVSU staff has been equally supportive as groundkeepers and full-time campus dining employees have asked to sign the petition. The majority of faculty has been reluctant to support the effort, but there are professors who have joined to express their support. 4) Is this a non-partisan effort? This is a non-partisan effort. This is a much bigger fight for education and democracy. Students are fed up with increasing tuition rates and tremendous debt. This is also the fault of the university administration, but they frequently attribute tuition increases to state funding. Direct democracy has been undermined by lame-duck session bills (Right to Work and private prison bill), referendum-proof bills, the Emergency Financial Manager law, and the Education Achievement Authority that is in progress. The voice of the voter has been replaced with the authoritative decision of a budget-cutting businessman. Although cuts may be needed, they should not be made to the education system. There are other places where cuts can be made without harming Michigan’s students. 5) If you are not able to prevent him from speaking at commencement, are there plans for other actions? On the day of the commencement? 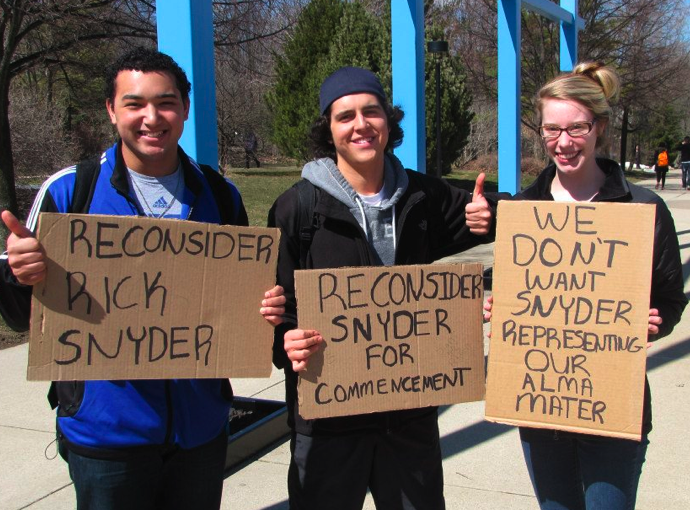 We will not stop voicing our concern until Governor Snyder is replaced as the 2013 Commencement speaker. However, if the administration does not replace him we will continue to protest until, and on, April 27. Further actions to fight for the democratic and education institutions in Michigan will be organized over the summer and implemented in the following years. The Commencement protest may end on April 27, but the larger struggle will move on. 6) Will there be any efforts to involve the larger West MI community that has been impacted from the anti-democratic policies of this administration? We have been coordinating a GVSU coalition that will provide a forum for dialogue about these kinds of issues. From there, we will decide how to take action. We have also been discussing a regional and state-wide effort, much like the SDS in the 1960s and 1970s. Once the same sort of dialogue resource has begun at other universities in the region, the strength of the student voice will be realized and taken in to effect. Student solidarity is the key, no matter what political or ideological affiliation.